Towards the end of recording the tunes for Quantum Nature, I started reading papers on linguistics and language development and their connections to consciousness. Discussions of consciousness, the abstract thing that enables us to cross the gap between a computer and an identity, sometimes step into the periphery of the domain of Chaos Theory. The implications of these concepts went on to influence my music and me as a person much more than anything coming from physics. More on that in future posts. 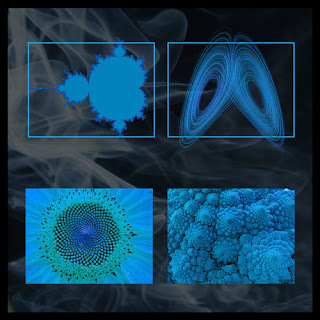 When I put this track together, I had no idea what a Mandelbrot Set or Lorenz Attractor was. I was still thinking about Maxwell and Newton, and not even scratching the surface of Schrodinger, Bohr, and Einstein. In reality, Chaos Theory is in a different world than regular physics. So the real story on this tune is a little simpler. I just needed a cool title for a song, and Chaos Theory appealed to me. This tune was written and recorded toward the end of the Quantum Nature project. I remember thinking that all of the songs were sounding too melodic and smooth. The album seemed to need something a bit more heavy and dramatic to provide a counter-balance. This song is louder and some of the chords and transitional parts are a little abrupt and chaotic. There is an instrumental tune on Rush's album Counterparts called “Leave That Thing Alone”. It is a very cool song with a recurring lead guitar theme that I absolutely loved. So I put together a similar melody and built my own instrumental track out of it. In the end, there is no comparison - the Rush tune is way better. But my tune does perhaps have its moments.